Former UFC middleweight championAnderson Silva will faceMichael Bisping on Feb. 27 at O2 Arena in London, officials announced Thursday. Widely considered the greatest fighter of all time, Silva (33-6) hasn't fought since he defeatedNick Diazvia unanimous decision at UFC 183 on Jan. 31. After the fight, it was revealed that Silva had failed multiple drug tests (steroids) that had been administered by the Nevada State Athletic Commission. The NSAC banned Silva for one year and changed the result of his fight against Diaz to a no-contest. Silva, 40, has maintained his innocence in regards to the failed tests. During a disciplinary hearing in August, the Brazilian legend blamed the failed tests on a contaminated sexual-performance-enhancing drug he was on. The Jan. 31 bout was Silva's first since he suffered a broken leg during a UFC title fight against Chris Weidman in December 2013. Silva holds the UFC record for consecutive title defenses with 10. He won his first 16 bouts in the UFC before losing the title in a knockout loss to Weidman in July 2013. Bisping (27-7) was originally scheduled to fight Gegard Mousasi on Feb. 27, but he now receives the matchup against Silva that he has long coveted. The British martial artist is tied for sixth all-time in UFC appearances with 24, but he has never fought for a UFC title. Both Bisping and Silva signed with the UFC in 2006, but they have not crossed paths until now. Now training out of Southern California, the 36-year-old Bisping is on a two-fight win streak. He was scheduled to fight Robert Whittaker at UFC 193 last month, but withdrew due to an elbow injury. According to UFC officials, Mousasi (37-6) is expected to remain on the London card, which will air on the promotion's digital service UFC Fight Pass. 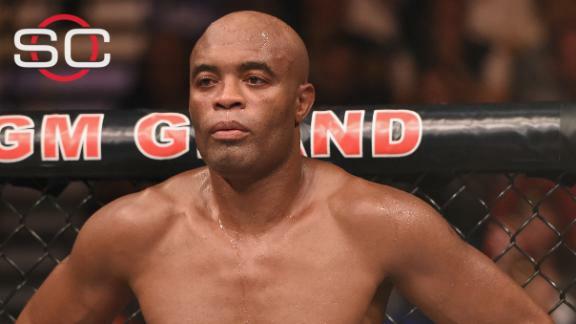 Brett Okamoto breaks down Anderson Silva's return to the UFC to fight Michael Bisping.